Many morbidly obese individuals also have type 2 diabetes. One of the most intriguing consequences of the surgery is that patients’ blood sugar levels normalize within days—long before any weight loss has occurred. Patients can often stop taking their diabetes medication even before leaving the hospital. Traditionally, doctors recommend weight loss through dieting and exercise to improve blood sugar levels—but this surgery lowers blood sugar levels almost immediately. Why this is, is a mystery—and if we understood the mechanism that might help treat diabetes more effectively in individuals who have not had bypass surgery. Research by many teams has suggested that reengineering the stomach and intestine changes the balance of hormones and alters gut-mind communication, which then reboots blood sugar control. But now an NIH-funded team at Boston Children’s Hospital has a completely new spin on this phenomenon . 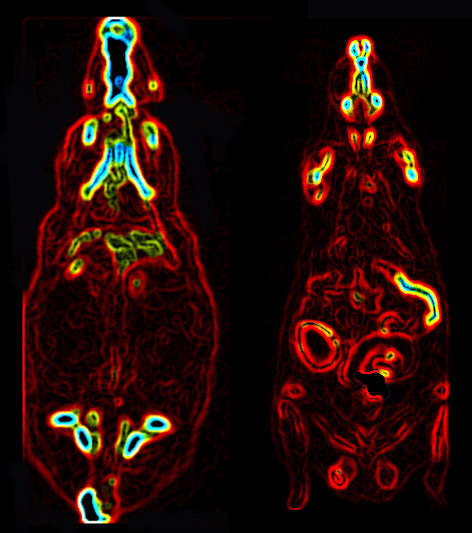 After performing the Roux-en-Y bypass in obese, diabetic rats the researchers found that the tissue forming the “Roux” limb (the new passage linking the stomach pouch to the lower gut) seems to grow and expand—an energy intensive process that requires a lot of sugar. The researchers suggest that as the intestinal tissue grows—in girth and absorptive capacity—it harvests glucose from the blood, dropping the sugar level in the blood and essentially curing the diabetes. Once the growth stops the intestine is a larger, energy hungry organ that has to work harder to sustain the increased mass; thus it continuously uses more sugar, which might explain how the effects of the surgery are sustained. What triggers the growth of this Roux limb? It seems that it’s exposure to the undigested food, which exits the stomach pouch undigested before continuing through the GI tract. Exactly how the Roux-en-Y bypass causes the human intestine to grow in this way still needs much more work to be understood. Obesity is a major problem in the US and globally. More than two thirds of Americans are overweight or obese. Type 2 diabetes, which affects 26 million Americans, goes hand in hand with obesity . Type 2 diabetes raises the risk of stroke, heart attack, blindness, amputations, kidney failure, nerve damage and a long list of other health problems. This new research raises the tantalizing possibility of using drugs rather than surgery to reprogram the intestine’s metabolism to remove glucose from the blood and lower sugar levels. Could we learn how to bypass the bypass? Reprogramming of intestinal glucose metabolism and glycemic control in rats after gastric bypass. Saeidi N, Meoli L, Nestoridi E, Gupta NK, Kvas S, Kucharczyk J, Bonab AA, Fischman AJ, Yarmush ML, Stylopoulos N. Science. 2013 Jul 26;341(6144):406-10. The problem is that there is not enough follow up on the mental health side of this surgery, and there is an increasing number of people who become alcoholics and use other means to substitute for why they use to eat. They change their personsalities and seem to change who they are when they lose weight. As a Type 1 Diabetic, the title of this article makes me cringe!! Do you know how that is taken by the general public? If I had a dollar for everyone who said if I ate right or lost weight (I am not obese by the way) that I could “cure my diabetes”??!?!?!?! Please be more mindful of this fact. This is due to the general misunderstanding of the different types of diabetes. Type 2 is often reversible through lifestyle–many case studies prove this. … But for Type 1, you can’t reverse a pancreas that isn’t producing insulin–only with a pancreas transplant. So, just educate people when they talk about a “cure” for diabetes–tell them the difference between types. Awesome, what a great finding. But why must you automatically charge right to the drug market? Why can’t you experiment with drug-free methods first, like prolotherapy? Maybe something as simple as an injection could start this wonderful reactive process going. What studies have been done on the changes such surgery may have on the nutritional status of the individual? Are we curing one problem and creating another? Exactly my thoughts as well! What happens to nutrition absorption for that missing part of the small intestines? Also, what is the nutritional implications for “undigested food” to be entering the small intestine when it’s designed for digested food? Also, this “increased sugar need” lasts for how long? It doesn’t address the core problem of DM2 [type 2 diabetes], which is insulin resistance throughout the body, not just in the intestines. So I don’t think this hypothesis addresses the root cause of DM2. I would love to hear from more people that have had the surgery. I had it 22 months ago and live in an area where there are no support groups. I would like to be able to discuss different symptoms and feelings I have since the surgery. Any suggestions would be great. So many unanswered questions about the mechanism of action, as well as long term prognosis. Any trials yet?? And how does alcohol come into this? Ellen is correct. Headline should say Type I. Journalism isn’t dead. Even though everyone isn’t a journalist, the NIH should strive to avoid misleading headlines. Thanks for your comments, David and Ellen. As Dr. Collins notes, the research findings discussed in this post pertain to type 2 diabetes. Good Morning. Gastric bypass procedures do help people in reducing their weight, but they have to change their lifestyle and eating habits. The nutrition and some enzymes needed in normal conditions are eliminated by this procedure. This needs more research and investigation to be sure that severe side effects do not take place. LOTS OF QUESTIONS AND CURIOUSITIES POSTED HERE. VERY FEW RESPONSES, OPINIONS OR STUDIED THEORIES FROM THE EXPERTS. IN THE LONG RUN, LIKE CANCER, RESOLUTION WOULD SHRINK THE SIZE OF THEIR BANK ROLLS, THUS NO SIGNIFICANT PROGRESS. THE ALMIGHTY DOLLAR CONTINUES TO RULE! SO SICKENINGLY PATHETIC! I believe that a possibility to alter the body to encourage the digestion of the sugar that is being produced may make the levels lower, but it is a blindsiding affect. There needs to be better testing with the long-term results of the repercussions caused by this abrupt reconstruction to alter the body.